Game Informer has announced that their April issue (#240) will finally pull back the curtain on Eidos Montreal’s long-awaited reboot to the Thief franchise. Oh, and the best news of all: It is no longer called Thi4f. I can’t even begin to describe to you how thrilled the WGTC gaming writers are that we never have to type out that abomination of a word again. 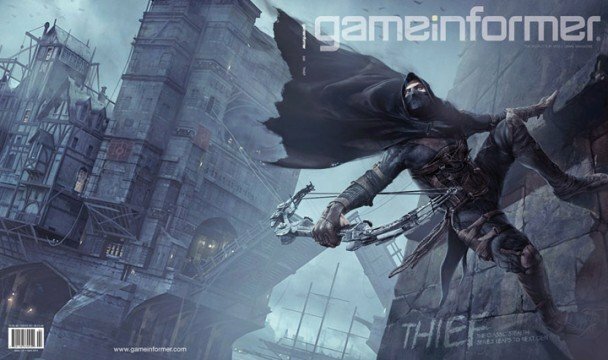 The short blurb on Game Informer’s cover reveal, notes that the next-generation stealth title will feature Thief‘s hero Garrett as he returns to “the City”. Being a thief, Garrett’s overall goal is to relieve others of anything that will make himself richer, however, those plans have to be put on hold due to circumstances within the Gothic, industrial metropolis. The City is “broiling with [the] social tension” that comes with being “ravaged by a plague and lorded over by a political tyrant known as Baron”. Players will have to pay close attention to the game’s environment, and make use of the multiple paths found throughout each level if Garrett is to survive. Currently, Square Enix is planning to launch Thief sometime in 2014 for the PlayStation 4, PC, and “other next-gen platforms” (we are expecting that this will soon be changed to read Microsoft’s next-gen Xbox). Having originally been announced way back in 2009 as a current-gen console game, the road to this Thief reboot has certainly been a long one for fans. Prior to today’s announcement, the last official word that we had heard about the game was last August when it was revealed to have been pushed to the next generation consoles. The April issue of Game Informer goes up digitally later today (the print version hits subscribers in the next two weeks), so we should start hearing some more details about the Thief reboot soon. For now you can see a few “behind-the-scenes” footage from GI’s coverage trailer below.